Valentine’s Day is quickly approaching, and similar to Christmas, finding Valentine’s Day gifts is not much easier. While the jewelry, flowers, or chocolate are always good go-to gifts, there are so many other options that will show your partner the love and appreciation they truly deserve. This February, Elements Massage is partnering up with 1-800-Flowers just in time for the holiday of love. Not only can you get an amazing deal on massages, but flowers as well. 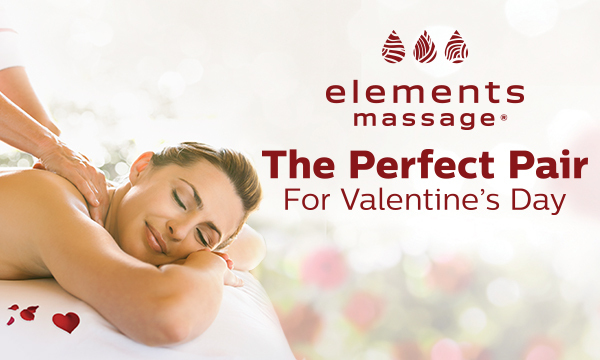 Similarly, Elements Massage is offering its own special promotion for Valentine’s Day too! This February 14th, give your partner the gift of relaxation and rejuvenation. Everyone has the chance to partake in our amazing offers during the first 2 weeks of February. Additionally, with our long list of massage services and specialties, there is something or everyone. Maybe your partner is an expecting mother who is in need of a prenatal massage rather than a new necklace? We have a service for that. Did you go on a long winter ski or snowboarding trip during Christmas? Gift your significant other a Swedish or deep tissue massage to receive the muscle soreness and tension that has arisen due to the physical activity on the muscles. Maybe you want to try something new and get an add on such as hot stones or himalayan salt stones? Well, you’re in luck. Not only do we have promotions that are applicable throughout all of our services, we specifically have an amazing promotion for our Hot Stone and Heated Himalayan Salt Stone massages during the month of February. We want to help « heat up » your Valentine’s Day with these different massage services. With the purchase of a massage gift card, you can receive a free hot stone or heated stone massage upgrade!The benefits of heated and hot stone massages are endless, but for a more detailed description of how these magic stones receive muscle tension and soreness or help with sleep and anxiety, check out our latest blog post that covers everything you need to know about Hot Stone and Heated Stone Massages. Apart from the heated stone promotion, Elements Massage and 1-800-Flowers have another amazing offer for everyone. For those who are a part of our Wellness Program, you can purchase 1 hour massage gift cards at a $30 discount and receive 40% off 2 dozen roses! Similarly, non-members get $20 off 1-hour gift cards and also receive 40% off 2 dozen roses. Kill two birds with one stone and get the flowers and the gift all in one amazingly priced package. Surprise your significant other with a different gift this year; this one will even improve their wellness. Maybe you have a partner who already gets regular massages or wishes that they do? Sign them up for our Wellness Program. Members of our wellness program get $30 off monthly massages and other amazing benefits each month during each of our promotions. For a monthly rate, you or your significant other can experience regular wellness at an unbeatable price with indescribable benefits. The gift options Elements Massage in Whitefish Bay provides are perfect because there is something for everyone. Between athletes, expecting mothers, stressed out parents or stressed out workers, people who want to improve their wellness, and more; there is a service that can be specially altered for everyone. Give the most loving and thoughtful gift yet this Valentine’s Day.